"I must first have the sense of God's possession of me before I can have the sense of His presence with me." --- Watchman Nee, The Normal Christian Life. We have the cutest Carolina Wrens and House Finches and speaking of small birds we also have baby Chickadees, which I wouldn't have known since it seems they like to stay pretty well hid. 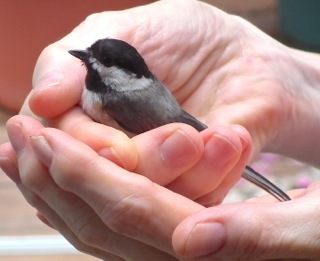 How I found out was when a tiny Chickadee hit the deck door while I was on the attached screened porch. It wasn't a hard hit so I expected things to be well, but didn't know it was such a small bird. It was flying with another bird that turned, so I assume it was a parent because but the little one that hit fell down into a flower pot. It was lying on its side as I scooped it up and it had its mouth open but seemed okay. No broken neck or wings. So tiny! I was so excited to hold it for several minutes and talk to it until it got over the shock. Randal took a few pictures. What a precious little treasure! Remember the deer we called Limpy last Summer that had a broken joint on one of its front legs? I've mentioned it this year when I saw it in the Spring and was so happy it had made it through the winter and that it seemed to be doing pretty well at getting around. She's a bit thin but we've got a lot of stuff growing around here that she likes. A few weeks ago I saw a lonely fawn with no mother in sight. I kept an eye on it and nobody showed. I thanked God that He "opens His hand to satisfy the desire of every living thing" (Ps. 145:16) and released it to His hands. A few days later I saw it and another fawn with the limping deer. How sweet! Of course she didn't have any milk, but apparently the fawns are big enough to survive and grow. With our "special deer" watching over them and showing them the good things to eat and the bad things to avoid. Randal challenged me on that name and I agreed it should be changed, but it took me a few days to come up with another. When I saw them together I decided to call her "Love Deer." 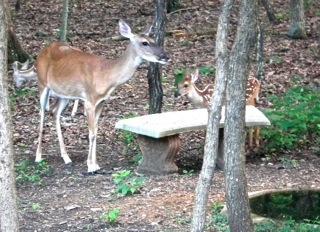 The love of the Lord has allowed her to live and she is now sharing her life with these two fawns. How sweet it is! 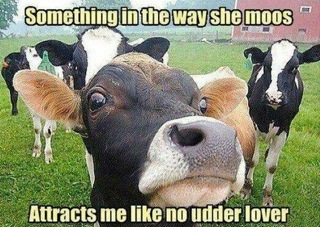 I've always loved cows. I must have fallen in love with them when I was a child. Our weekend entertainment (besides the fascination of television) was to take a country ride. I loved animals so I wanted to have any that I saw. Watching Flicka I wanted a horse. Seeing Lassie, I wanted a dog. Growing up in Amish country, I got to see a lot of cows face-to-face because we would go to various Mennonite farms to purchase eggs, produce or baked goods. For a young girl living on the third floor of an apartment building in the city, the country with wide open spaces was quite a fascination. The love of farm animals is why I became a vegetarian. There are many Scriptures about the care of animals. God made them to be friends of Adam before making him a wife. The Fall messed a lot of things up, but God has always had compassion on His Creation and had many commands relating to the treatment of animals that were in service to man. Factory farming has taken away the sweet images of cows in a pasture. I finally uploaded three new videos. One is of a Eastern Tiger Swallowtail Butterfly gathering nectar from the Homestead Purple Verbena flowers. Another of a squirrel gathering a ball of rope from our hammock which we donated as the Squirrel Seal Team Training Center. The squirrels loved that hammock and would jump all over it and then dive down, climb up the ropes, bounce off the trees, spin on the ground. It truly was a busy exercise until they took it down to the ground, but this squirrel probably got some merit badges for taking home a mouthful of rope. The last squirrel video is of two squirrels jumping all over each other, around and under a tree, rolling around and having a good time. The banded net-winged beetle (Calopteron discrepans) is a colorful black and orange and commonly found resting on vegetation in moist woods throughout much of the eastern United States from New England south to Florida and west to Oklahoma and Kansas. 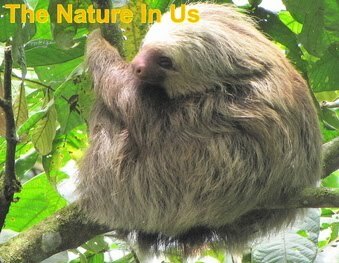 The adults range in length from approximately 3/8-5/8" (10-15 mm). Males are smaller than females. The front wings (elytra) on most beetles are hardened and they cover and protect the hind wings and abdomen; however, net-winged beetles have soft, leathery elytra (a pair of hardened forewings of certain insects, as beetles, forming a protective covering for the flight wings). The design pattern on them is amazing! 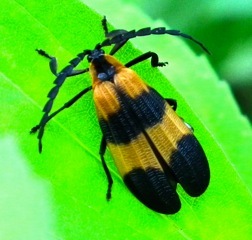 It is speculated that their bright coloration provides a warning to predators that these beetles are not good to eat. Adults are active during the day and they feed on decaying plant material, and occasionally on other insects. The larvae are predaceous and consume a wide range of prey including insects, slugs, sowbugs, and millipedes. Thus, net-winged beetles are considered beneficial insects. I love finding evidence of all the beneficial insects our wildlife habitat has attracted since we don't use chemicals and pesticides. Yesterday I saw some hummingbird moths at the garden phlox. They seem to love those flowers. I told Randal that you can cup your hands around them and feel their wings beating so we went outside for him to experience that. I did it first and the one I placed my hands on both sides of while it was feeding on the flower stayed about 5 seconds and then sat on my thumb for a slight moment on his way up and out to another flower. What a sweet moment in life. Randal did the same thing and I loved the smile on his face. God gave us such fun things to experience in gardens. No wonder He chose a garden setting as the best place on earth for Adam and Eve. I wonder if Eve cupped her hands around a hummingbird moth. Read a previous blog post on Clearwing Hummingbird Moths. 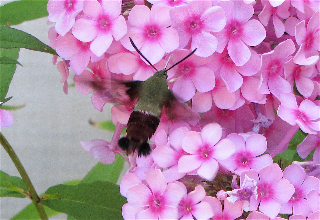 View a video of Clearwing Hummingbird Moth feeding. Another blast from the past .... While our son was still at home growing up, we decided to send him to a Wilderness Academy. The corporate headquarters for a line of products that we distribute is in Utah and we had visited a number of times on award trips for convention, getting to know some people within the company. One of those people left the corporate life to oversee this Wilderness Academy that put troubled teens into a primitive lifestyle to get them into a bit of reality. Our friend had a son the same age as ours and he wanted him to go through the adventure, but not with the group of troubled teens. Actually he wanted to see how a 10-year old would interface with the program. It was normally a six-week program, but these two boys went out for three weeks with a guide dedicated to them. It was quite the trip for Benjamin and for us with him being gone that long. 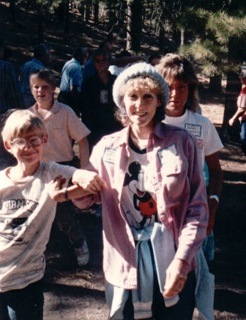 That was in July of 1989 and it must've seemed really good since we ended up accepting another opportunity for Ben to do another three-week adventure with us going out for the last week of his time there in October. I was always up for an adventure, but this one was certainly a challenge. We had to backpack everything (picture 48 lbs. on my back) and since it was a primitive camping mode, there was nothing left behind and even ashes from fires were packed out. Food was prepared in tin cans and your "bowl" was a tin can also. You would think I just fit right in as much as I love nature, but back then I had lived in suburbia and I was still terrified of bugs. Even sitting on the ground was stressful. We hiked 13 miles a day in the hot afternoons and slept in a tent at night in the cold of the Utah mountains. They actually made the exception for us being able to use a tent. No toilet paper (unless you wanted to backpack it out, which we did not), so you used the soft inner bark of the juniper tree. Drinking and cooking water was taken from a stream and with mountain cold streams, nobody was taking baths. At the end of the week there was a festive day with family meeting the teens that had been out in a different area and it was an emotional time when they did a "run-in" to their parents. Ben and his friend was part of that with us waiting. They had us dancing the Virginia Reel and eating better than trail grub. View Utah Wilderness Adventure photos. Since they're scanned prints, they're not as sharp as my regular photos. I'm working on Dr. Caroline Leaf's 21-Day Brain Detox Program and am very excited about it. 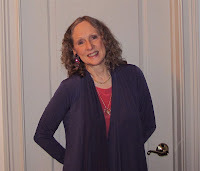 I've also learned so much from her website about the brain and her focus is on how God created us to be perfect and our thoughts should line up with that. Been watching some YouTube videos of her also to get my brain integrated into these awesome scientific principles. She has a gift of breaking down the complicated terminology of the brain into everyday language. My husband even mentioned to somebody at church yesterday about how much I was changing. WOW! I love it when science catches up with God. God does tell us in Matthew 5:48 to "be perfect as your heavenly Father is perfect." He designed our brains to have healthy thoughts and neurons so it can produce the feel-good chemicals that keep our mind focused and in peace. It's also a scientific fact that we can control our emotions and thoughts - "Casting down imaginations, and every high thing that exalts itself against the knowledge of God, and bringing into captivity every thought to the obedience of Christ" (2 Corinthians 10:5) and that we can renew our minds - "Do not conform to the pattern of this world, but be transformed by the renewing of your mind" (Romans 12:2). God never tells us to do anything we can't do.